63) Angostura 1919, Deluxe Aged Blend, Trinidad & Tobago. 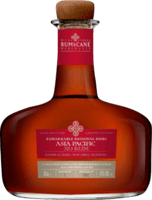 A blend of molasses-based, N- Not often rum improve with breathing, but this one an exceptional. Initially with white fruit and condensed milk + black tea, very local 'teh-xi'. 56) Admiral Vernon's Old J, Spiced. Spirit made with Caribbean rum from Trinidad and N- Fat melted vanilla ice cream with a layer of thick bols cacao brown and baileys. Whiff of raisin with loads of brown sugar and peppery raw spirits. 7) Cachaça 51 Brazil. Unaged, sugarcane juice on column still N- Ginger flower, tropical fruit punch and mint candy, fruit peels with eucalyptus at the tails. Probably some syrup added as it appeared quite sweet.